I received a pair of glasses free to do a review, all opinions are my own. Hey Yall! How has your week been so far? Have you already started your holiday shopping? If you're still looking for gifts to buy your loved ones I have a unique gift idea that anyone on your holiday wishlist will need. Let me explain all about it. As you all know, my job involves me being on the computer all day, every day. 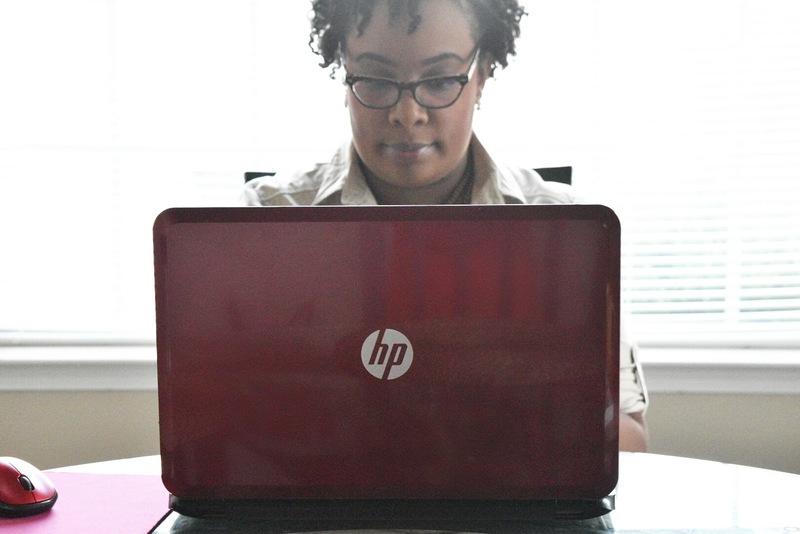 When I'm not in front of my computer, I'm always checking up on social media updates, monitoring my blog comments, and checking emails on my cell phone and tablet. With my eyes front and center in front of a screen all day, my eyes have become very strained, and I start feeling light-headed. My eyes have gotten so bad that I squint at my computer screen and when I drive I have to wear my sunglasses even when the sun is not out. I often develop terrible headaches too due to my eye strain. Also, I look tired all the time, and now I'm starting to develop under eye wrinkles due to me squinting. 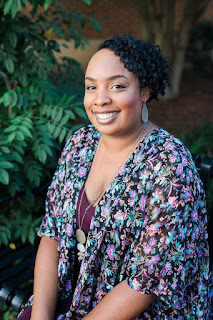 I try to give my eyes a break while at home on the weekends by limiting myself on electronics, but life as a blogger it is difficult to take a break. 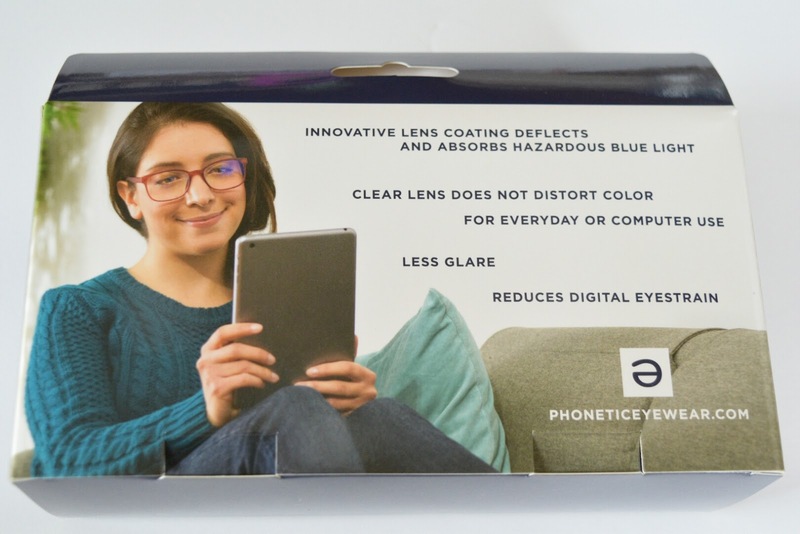 I always wondered if there is something out there that I could use to help me protect my eyes, and recently I learned about PhoneticEyeWear.com, an eyewear company based in Pittsburgh, PA dedicated to protecting eyes from digital eye strain. I went on Phonetic Eyewear website and browsed their selection of computer glasses, and I'm very impressed by how trendy and stylish their glasses are. You have a choice to choose prescription, non-prescription, and reading glasses. The prices of their computer glasses are affordable so you can get different pairs to match your different styles. Non-prescription Phonetic Eyewear uses innovative blue light filtering technology to reduce digital eyestrain and create a more pleasurable viewing experience on your computer, smartphone, and tablet. LED computer screens, smartphones, tablets, and CFL lighting emit a disproportionately large amount of light in the violet-blue portion of the spectrum. Often referred to as blue light or High Energy Visible (HEV) light, this portion of the spectrum has a higher energy content and can cause digital eye strain, headaches, and fatigue. 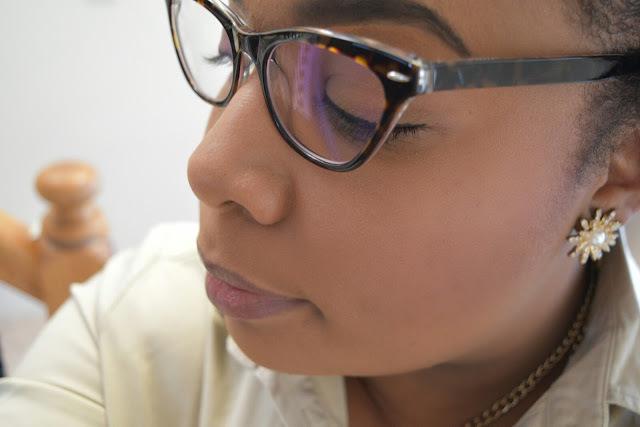 Phonetic's lenses utilize a special coating that decreases more than 30 percent of the harmful light, thereby reducing eye strain and improving focus. The glasses I chose was non-prescriptive Joan ($59) because I love cat eye style glasses and the color would go well with many different outfits. Shipping was fast, and I was able to start wearing my new computer glasses in no time. I like the fact that the glasses came with a pouch to keep the glasses protected because if you know me I stay damaging glasses. Also, it came with a cloth to clean the glasses lenses. I wore my computer glasses while doing some work on the computer and immediately I wasn't squinting and didn't have tired eyes after a long day of working on the computer. 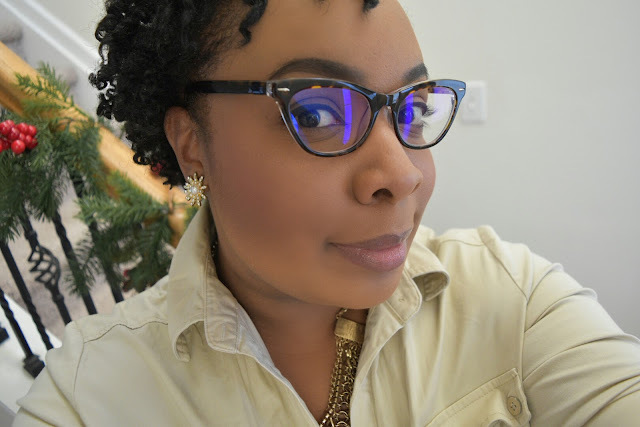 However, one thing I didn't like about my glasses it was too small and I don't blame Phonetic for that since I have a large head (don't laugh, I blame that on my father). It's neat how I see blue reflection through the lenses and still be able to see the screen clearly. I told you that these computer glasses would be a great unique gift for anyone on your holiday gift wishlist. Almost everyone has electronics, and the world we're living in today people are addicted to staring at their electronic screens every few minutes, so having computer glasses to protect your eyes is a must! Would you like to win a pair? 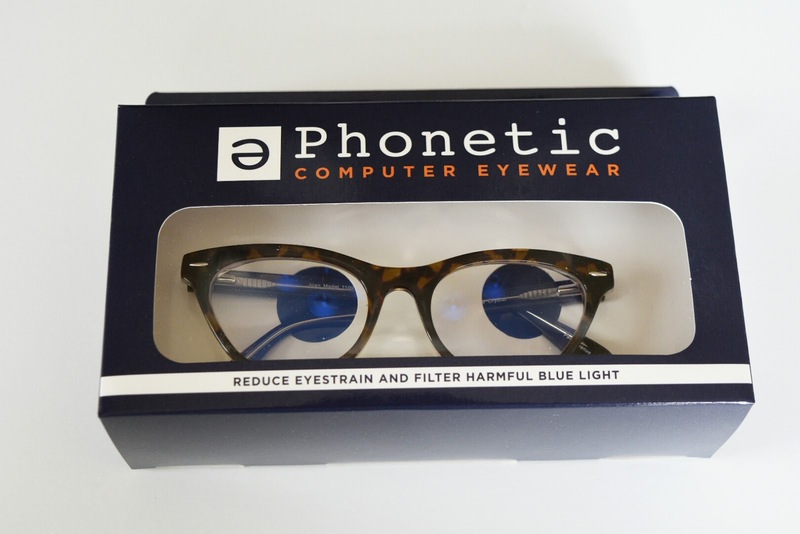 One lucky winner will win a Phonetic Computer Eyewear of their choice. You must follow the giveaway rules to have a chance to win. Giveaway ends 12/17. Good luck! 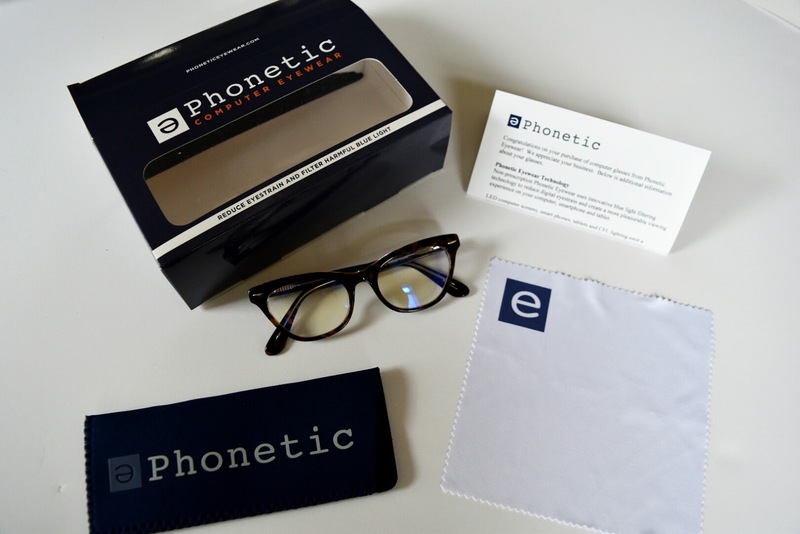 Which pair of Phonetic Computer Eyewear would you like to win? Giveaway Rules: Must be 18 and older to enter and live in the US. No purchase is necessary to win. Blogger who is hosting the giveaway is not responsible for winner's prize, sponsor of the giveaway is. Winner will be contacted by email and have 48 hours to claim their prize or new winner will be chosen. Wow!!! The eyewear sounds neat especially if it's going help the eye strain. I would love to win a pair of prescription eyewear. I have been working in IT for almost thirty years and my eyes definitely need a refresher. I'm on the computer pretty much ALL day in my line of work. I'm very curious to see if it would aid to resolve tired eyes! Thanks for entering Janet. I think these glasses would be perfect for you, especially since you work with computers. I spend my whole day in front of a computer too! I might need these! You need to check them out girl! Oh could really use these, I'm on the computer an insane about of time. Would love to try the Robin in Snow Whiskey! Interested to see if these will help with tired and strained eyes! Thanks for sharing. Great pick Robin! And it's the same name as you! I was surprise how affordable these computer glasses are. My daughter's prescription glasses are so expensive, so it's refreshing to see glasses not breaking the bank. Don't worry girl your not alone. I got a big head myself lol but if I was able to pick I'D like the ANDREW in Amber Tortoise for Reading, computer, and cell phone. To be honest I like the ones you picked as well but I'm afraid there going to look tiny on my face. But either way I would be grateful to win either one. Hehehe!! My head can get in the way of things. My glasses are nice, but fit tightly. I'd love a pair of the Royales in Deep Crystal Violet. Thanks so much for sharing these glasses. I will certainly have to get a pair. Hopefully they'll help with the dryness I experience from staring at the computer along with the eye strain. Those will suit you well. I'm unsure about the dryness since I don't suffer from that. Those frames look good on you. I spend my whole day in front of the computer and I already wear glasses or contacts...I will have to look into these! My experience with computer screens is that my eyes tend to become set in one position of focus if I stare at the screen for too long, which can cause double vision when I jump into the car at night. Not sure the specs would help with that, but the other features are very desirable. Can I get these specs in the UK...? Hey Ray! I still have double vision at night if I don't wear the computer glasses while working on my devices. I spoke to the representative of Phonetic to see if they ship globally, and unfortunately they do not. Please contact me directly if you're interested in getting a pair of glasses and the rep will see what she can do. The Bravo glasses are one I would pick. I love the Bobbie. It comes in the prettiest shade of purple. I have a pair but the lens are way to dark and I took like a goof,,, these look perfect! And that shape really looked great on ya to Lou!!!!!! Now this is something I would love to have! They look cute too. I wonder if eye strain is the cause of my frequent migraines. My full time job keeps me at the computer for 40 hours a week. I, too, blog and then there is all of my hobbies that keep me in front of the screen. I am going to have to check out the styles of frames they have available. I love the blair or the lindsey! SO cute! I definitely need these. I spend all day in the computer and have developed dark circles and have terrible eye strain. What a great product! I, too spend a ton of time staring at my computer screen...so this would come in very handy for me. I would love to have the Ellie in Black Pearl!